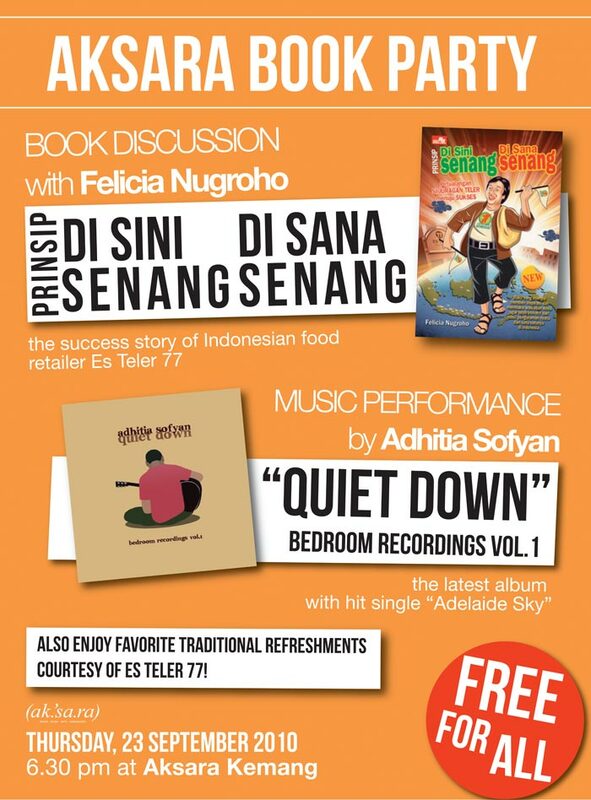 Aksara is throwing a book party tonight for Felicia Nugroho, who recently published her biography of her father, the late colorful and enterprising Sukyatno Nugroho. The title of the book is Prinsip Di Sini Senang Di Sana Senang and recounts the life of Sukyatno from his childhood in Pekalongan to various daunting challenges and failures before he founded Es Teler 77, one of Indonesia’s earliest local fast food franchises that is also one of the largest today. Tonight Felicia will lead a discussion on her book and the lessons on entrepreneurship her father bequeathed. There will also be entertainment from Adhitia Sofyan. Hope you have time to pop down there.